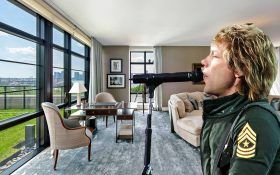 For $15.995 million, Jersey rocker Jon Bon Jovi has finally sold his duplex apartment at 150 Charles Street, a celebrity haven in the West Village. 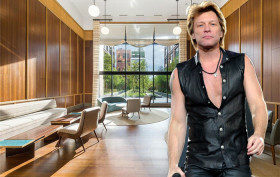 But the “Livin’ on a Prayer” singer isn’t moving too far away; he recently bought a nearly $19 million apartment in the Greenwich Lane, a condominium project that stretches almost a full city block between 12th and 11th Streets off Seventh Avenue. 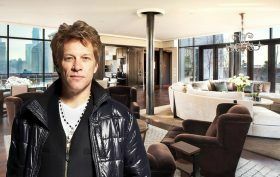 While Bon Jovi attempted to sell the duplex as a $29.5 million combo unit with a neighboring duplex this summer, the apartment went into contract alone, for $15.995 million, according to the Wall Street Journal. Jon Bon Jovi hasn’t released a new album in quite some time, but one way he’s managed to stay in the spotlight is his real estate game. In 2015, he sold his Soho penthouse for $34 million, shortly thereafter picking up a sprawling duplex condo at new celeb-favorite 150 Charles Street for $13 million. Less than two months ago, he listed the West Village pad for $17.25 million, but he’s already gotten impatient, now offering the pad as part of a $29.5 million combo unit with the neighboring duplex according to Curbed. 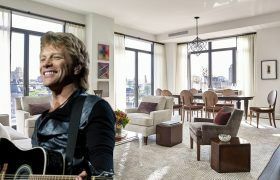 A year and a half after Austrian-American businessman and investor Gerhard Andlinger scooped up Jon Bon Jovi’s Soho penthouse, he’s put it back on the market. The rocker bought the sprawling duplex at 158 Mercer Street in 2007 for $24 million, then listed it in 2013 for $42 million. After several price cuts, and some interest from supermodel Heidi Klum, Andlinger paid $34 million for the home in June 2015, but it looks like he’s ready to “Runaway,” as LL NYC tells us that it’s re-listed for $38 million.